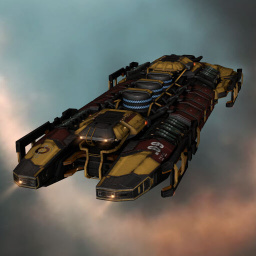 The exhumer is the second generation of mining vessels created by ORE. Exhumers, like their mining barge cousins, were each created to excel at a specific function, the Hulk's being mining yield. The additional yield comes at a price, as the Hulk has weaker defenses and a smaller ore bay than the other exhumers. The Hulk has the greatest yield out of all the exhumers, but at the cost of the lowest tank and smallest ore hold. As a result, it is best to use the Hulk with fleet support so as to mitigate its weaknesses and allow you to leverage its superior extraction rate. A tank can be fitted, but it is still possible to gank even a maxed Hulk for profit with the correct ship in some areas of highsec, although its more than able to handle most NPC rats. Further information about additional or recommended skills to pilot Hulk for a specific or it's common role(s) can be written here. No sub-article about Hulk roles or piloting tactics. You can write them here. You can write additional notes for Hulk here. This page was last modified on 2 November 2017, at 17:20. This page has been accessed 196,813 times.